It is not clear exactly where and when the crossbow originated, although one school of thought is that it was first used in China during the 5th Century BC. There is also evidence to suggest that the Ancient Greeks were using them a hundred years earlier, shooting crossbow bolts at the Corinthians. There are also reports that Alexander the Great employed crossbow men in his armies. And let’s not forget the tales of crossbow men fighting the infidel with Richard the Lionheart. The use of crossbows in European warfare probably dates back to Roman times and was certainly evident during the Battle of Hastings. William II, Henry I and Henry II all employed crossbowmen, chiefly foreign mercenaries, in their armies. 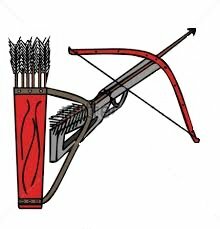 The crossbow almost completely superseded hand bows in many European armies in the twelfth century and were in use until about 1500 AD. It was about this time that gunpowder weapons came to the fore. There are numerous accounts on record of the use of crossbows in modern warfare. There is documented evidence that they were used on more than one occasion by French partisans against the occupying German forces during the Second World War. American special forces seriously considered their use during the Vietnam War and more recently it has emerged that Serbian forces used them during the conflict in Kosovo. Special forces in both Greece and Turkey also continue to employ the crossbow as do Spain’s Green Berets. In Asia, some units of the Chinese special forces utilise crossbows. One justification for this comes in the crossbow’s ability to stop persons carrying explosives without risk of causing detonation. During the Xinjiang riots of July 2009 crossbows were used alongside modern military hardware to quell protests. The Indian Marine Commando Force were equipped until the late 1980s with crossbows supplied with cyanide-tipped bolts, as an alternative to suppressed handguns. On a more light-hearted note, there is a tale of a certain British officer who fought in the Great War. He was an accomplished arbalist and put his crossbow to good use firing arrows high in to the air so they fell inside the German trenches killing a number of German soldiers. The story goes that he was hauled up before his commanding officer and ordered to hand over his crossbow. Apparently it wasn’t cricket to be killing Jerry like that!